After spending just about an hour in Cobham’s press conference room, Mourinho dashed all the dreams Tottenham had of finding a replacement for Gareth Bale . Spurs had done absolutely everything, from flying him and fixing him a hotel room, to taking an early medical before signing the contract. However, reportedly, Roman Abramovich’s connections with Anzhi Makhachkala‘s Russian owner helped the West London outfit secure the highly-rated Brazilian’s signature. He was stolen away from Corinthians by Mircea Lucescu, the Shakhthar manager, who in adherence with the club’s policies, was ravaging the South American continent for cheap and talented football players. At the age of 24, right before entering the age many experts believe that a wide midfielder can experience his best playing days, he moved to Russia and covered himself with rubles. Michael Emenalo, the technical director at Chelsea Football Club, has been a long term admirer of Willian’s talent. He firmly believes that if the young Brazilian is to don the famous blue jersey, then he can make it big. On comparison, you can clearly say that when he was at Corinthians, he was known as the poor man’s Joe Cole. Fantastic ability to get past any defender that presses him. His immense dribbling is now being compared to national compatriot and Barcelona’s newest acquisition , Neymar. He is very pacy, which makes him a delight to watch when he’s running down the flanks with the ball at his feet. He usually cuts in, and unleashes a fierce shot at goal. However, his eye looks out more for an assist rather than a shot. He is primarily a creative force , with Adriano having to take the responsibility of getting the goals at Shakhtar. In five games for Anzhi, he has had a shot accuracy of 100%, 16 chances created and an 85% average pass accuracy. Moreover, he has an immense amount of work-rate, often coming back to defend for the full-backs to help them out with defending. Pace, trickery and loads of Samba-styled flair. All packed in 5 feet and 8 inches. He hasn’t scored yet for Anzhi. Apart from that, he has only 21 goals in 151 appearances. He isn’t meant to be a player who can bring home the goals. He depends on his turn of pace, and precise passing ability to split apart a defence. If a team expects him to score every game, then they’re going to be disappointed. One doesn’t see much sense why Andre-Villas Boas would look at the Brazilian to be a replacement for Gareth Bale. He makes marauding runs, cuts in , but is more likely to look for an assist than shoot. At Shakhtar, he was usually deployed on the left wing. This enabled him to get forward and cut inside when the full-backs when pushing up to provide width. As mentioned before, he also comes back to defend, a characteristic that Mourinho requires from his creative players. Moreover, he has also played in the number 10 role when asked to. You could sum it up by saying that he is versatile and can play anywhere across the midfield with decent defensive attributes. He is perfect for counter-attacking, but considering that Mourinho’s philosophy revolves around possession, Willian and his high passing attributes can be put to good use. 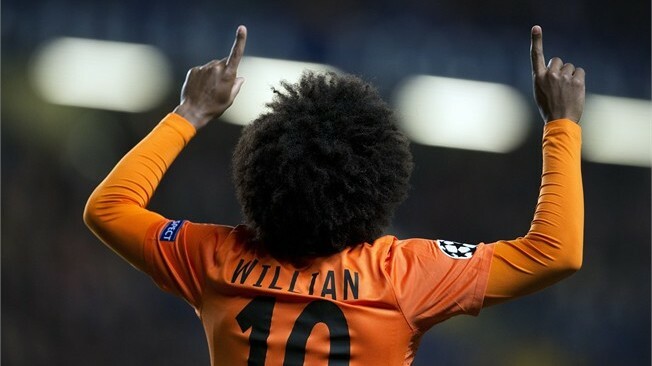 Overall, Willian is one of the un-tapped resources of world football. One will never understand why he chose Anzhi, but he gets a chance to resurrect his career. If he cements a first team spot at Stamford Bridge or White Hart Lane, Brazil and Luiz Felipe Scolari will come calling. It’s a win-win situation for the player and the club. The most likely candidate to suffer that is Victor Moses. The Nigerian winger isn’t expected to make a great deal of impact under Mourinho, and many would have him go away to make space for the Brazilian. Willian can also play in the number 10 role, so he just increases Chelsea’s depth, something they lacked last year. The future is bright, and the future is most definitely blue. No way Schurrle is going on loan. Much better player than Moses. I hav never really seen anytin special frm dis player called willian.why does chelsea like wastin big money on notin. Are you kidding me? he was amazing against us last year. When he played for Shaktar. A waste, don’t need him. If Mou didn’t have a headache before he must surely have it now as to who is his preferred attacking trio and with the world cup around the corner he will struggle to keep everyone happy as they call want a national call up for the world cup? If I ask which is our best attacking trio I’ll get different answers almost all the time, take that and put Willian in the mix…. Is it neccessary? I don’t think so, should have bought another CB atleast or a striker not an attacking midfield… WASTE!!!! Listen mate, for me this is the best piece of business Chelsea have done this summer. Schurrle is good but not as good as Willian. The more players we have the more competition in the squad and therefore better performances from players. Mata and Hazard are obviously our best players, but we are all human beings and complacency always creeps in at one point or another and the special one knows this. He will use this to his advantage. Since Chelsea is overwhelming with midfield talent, they should operate like Spain, without a striker. Only when they play Lukaku should they revert back to their 4-2-3-1, if not we r wasting too much talent on the bench. I hope by the time we buy all player on heath, we will stop. I said before when we what to buy andrel and van. People are saying we will sale someone and leave someone without thinking about how to have use of them. As far as we are condeming one player for another, the team we continue have problem. Fan by now i don’t expect us to be putting more pressure on sign player. Look at all our lone players they do get better when ever they are out even the team they went to don’t have player as we have. Eg lukaku last season, did their team have player as we have? Please fan let thinks how to make good use of what we have than buy these sale those. With great mildfider we have, i don’t expect any team to find it easy for them to play us. If we buy this buy that how will be chance for our young one. Mr jose shoud make good use of what we have, let them play beautiful ball. See combination of mata, hazard and oscar last season. Are they not the same, let them make good use of ball, not them run up and down only. I love chelseafc. Williams is a good signing no doubt but don’t expect Moses to go out on loan cos is home grown, therefore expect ba to go out. We’ve not seen much of schulle to judge him so please let us wait and see. When the going gets tough we will see. I think it should be: hazard and schurrle on the left — mata and oscar in the middle and de bruyne and willian on the right. Moses must replace Mikel as a denfensive midfielder. Mikel and Torres or Ba must leave now! Imagine an absurd response! How could Moses replace Mikel as a defensive midfielder?Well,well and well,Willian is a very good player,there’s no doubt about that but it will definitely create a selection headache for Mourinho! Don’t buy players for staging on a fantastic display against Chelsea …. Even Moses was bought after he terrorised Chelsea defenders when he was with Wigan. So better be sure of what this William can do before securing his move to the bridge not just because he did well against chelsea in CL. Moses have the strength which is an advance And even can play better if he gets more minutes but I will like him to go on loan to another English club there he will shine like a star like wilshere,lukaku,sturidge and many more. Chelsea parade many stars and too much stars kills a team. Now morinho will be having headache on selection. A good blend of players is what a team needed, …good,better,best makes a team strong….. 2002 world cup, Argentina paraded world best stars which sent them early packing in group stage.